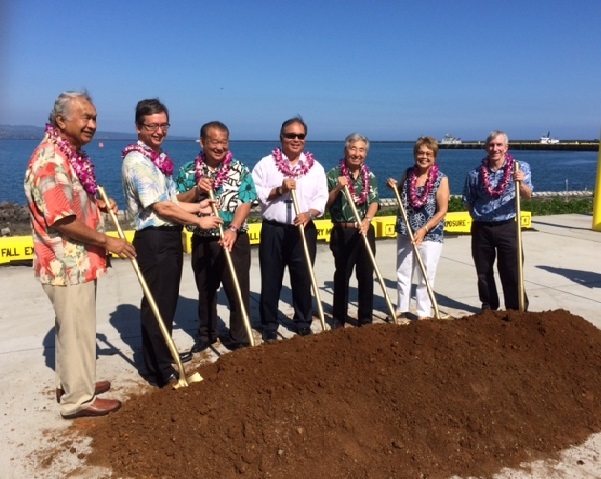 HILO – The Hawaii Department of Transportation (HDOT), Harbors Division, celebrated the Pier 4 Project at Hilo Harbor with a groundbreaking and dedication/blessing ceremony earlier today. The project consists of multiple phases: dredging and construction of the Pier 4 Inter-Island Cargo Terminal, construction of the Inter-Island Cargo Terminal Facility–Container Yard, and Kumau Street Entrance Improvements. HDOT will begin work on the final phase of the project, the Pier 4 Inter-Island Cargo Terminal. This phase involves the creation of a 602 linear foot reinforced concrete pier with associated site work that will be located to the west of the existing Pier 3. 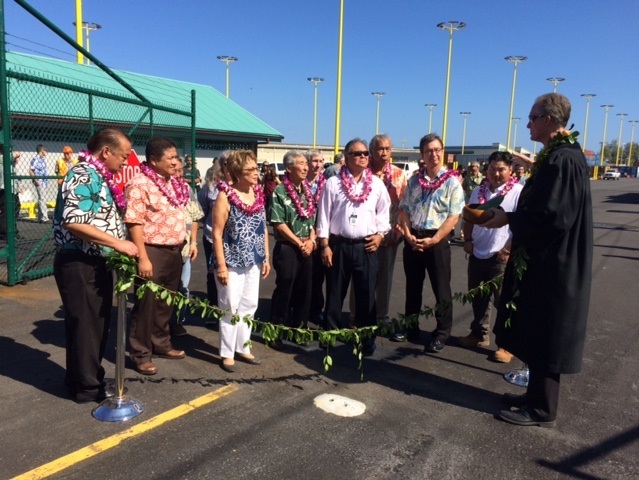 The completed Inter-Island Cargo Terminal Facility–Container Yard component of the project reconstructed a portion of the existing container yard and built a new adjacent container yard with a comfort station, lighting, and utilities. This phase generated an additional 4 acres to be used for cargo operations, amounting to approximately 10 acres total. In order to relieve traffic congestion and enhance safety, the completed Kumau Street Entrance Improvements widened the street from a 2-lane roadway to a 4-lane roadway and provided intersection improvements at Kalanianaole Street. Improvements include new asphaltic concrete pavement, concrete sidewalks, curbs, gutters, drainage system, water main, and additional street lighting at the Kalanianaole Street Intersection. The estimated total cost for the project is $68.5 million. Work on the final phase is anticipated to be completed by July of 2017. Currently, inter-island cargo operations are conducted at Pier 2, a pier constructed in the 1920s that functions with restrictions. Due to space limitations, operations at Pier 2 require space from Pier 1 and Pier 3. This creates the intermingling of cargo and cruise ship operations. The utilization of Pier 2 is also compromised when liquid-bulk operations occur at Pier 3. Creating Pier 4, a larger pier with a dedicated area, will improve safety and efficiency by separating the cargo and passenger operations. It will replace the aging Pier 2 and be able to support new container handling equipment and vessels.